As a registered independent apprenticeship training provider, we offer levy-funded qualifications and development programmes specifically for Recruitment businesses. Recently voted the Recruitment industries Training Provider of 2018, we understand your industry and are well placed to help employers navigate the sometimes-intimidating world of funding, standards and assessment. Recruitment Juice is listed in the Education and Skills Funding Agency’s Register of Apprenticeship Training Providers (RoATP). Proud to be voted Training Provider of the Year 2017 and 2018 (Recruitment International) due to our commitment to excellence and focus on engaging training that changes behaviours and improves performance. Exclusively focussed on the recruitment sector, delivering innovative learning solutions for 11 years. We aren’t coming in to your business with just one product to sell, we develop bespoke blended learning programmes. Not every business is the same, so not every development programme can be either. The Juice team develops programmes alongside employers, looking at their key business drivers and ensuring what we create will work for your individual business. Our highly successful, award-winning courses for Recruiters are already used by Recruitment companies across the globe. 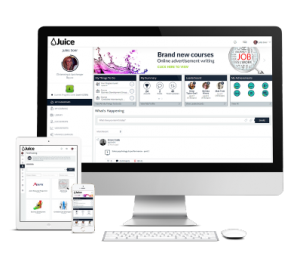 Now, Juice also brings you experienced Apprenticeship Trainers to help design and deliver our bespoke blended learning programmes, enabling us to offer companies a unique service to help push businesses forward and offer staff opportunities to further their development and progress in their job roles. The Juice team have a range of specialist experience in Recruitment, Training, Online Learning, Sales, Customer Service and Apprenticeships. Our Apprenticeship delivery team include trainers that have been rated Outstanding in OFSTED audits and all are highly motivated and passionate about delivering outstanding recruitment training programmes.